OK. So coming up with things that begin with y is tough. You look and you think and you yodel (probably not!) and then you realize they are right in front of you – at your breakfast table (yogurt) and on your dinner table (yams) and in your knitting basket (yarn). If you live in the Himalayas, you see them out grazing in the pasture (yaks), or if you live in the harbor you might have one at your dock (yacht). Then again, if you’re just a kid, you might find one in your pocket (yo-yo). 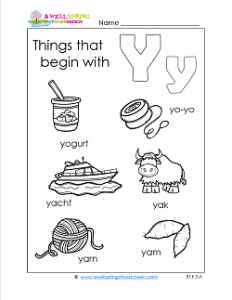 Please enjoy sounding out and circling the beginning y words on this worksheet.